Copyright © 2004 by Roy Hempley,Â All rights reserved. (1) “New York Bach Stradivarius Trumpet and Cornet Bell Markings”, Revision 1, September 10, 2004, Roy Hempley and Doug Lehrer. Gilbert H. Mitchell (LTC AUS Retired), one of the Band’s most prominent trumpet players, knew Bach from his earlier orchestral days. Mitchell played trumpet in the Band from 1946 until 1960 when he became its Assistant Leader. For nine of those years, he also was solo cornetist. Mitchell figured prominently in getting two Bach bugles for the Band. What Mitchell wanted were some Bb bugles that played more like the Band’s Bach trumpets. He asked Bach to make one, and Bach delivered one for trial in 1950. It turned out that it was twelve years later until another one was delivered. Both were unique, essentially one-of-a-kind instruments. The next section of this article describes those two bugles along with some history about their use. The Army Band and Bach entered “business” about the same time. The band was founded in 1922, just two years before Bach began making instruments. Since then, it has continually provided entertainment and ceremonial support at events all across the United States and abroad. Among its many ceremonial duties is providing buglers for burials at Arlington National Cemetery. The buglers also play taps at the Tomb of the Unknowns (formerly the Tomb of the Unknown Soldier), which also is located in Arlington Cemetery. In continuous operation since the Civil War, Arlington Cemetery is the most famous burial place for the nation’s military service members and selected dignitaries. Military funerals are highly moving ceremonies honoring those who served their nation, and the sounding of taps contrasting with the rifle volleys immediately preceding it is perhaps the most moving event in them. Written during the Civil War, taps is a simple tune, but it is not easy to play with the appropriate combination of beauty, emotion and serenity demanded by these occasions. Each bugler develops his or her style within limits defined by military custom and good taste. A not-so-obvious fact, however, is that buglers sometimes must render this solemn symbol of mourning under the most difficult circumstances, which might include hot or cold weather, rain, etc. There is no room for error regardless of the demands. All of the buglers of the Army Band are special people, but one of them is designated as the principal bugler. Normally this bugler would perform at the most important ceremonies. The following is a recent list of principal buglers. * Victor Christensen was one of the Army Band’s foremost buglers before the time period of the above chart. He shared duties as principal bugler with George Myers until his retirement in 1956. The authors believe that he used the earlier of the two Bach bugles discussed below for some important ceremonies. None of the other services’ bands use bugles to sound taps. Their “buglers” use trumpets instead. Trumpets do not sound like bugles, and they certainly do not provide the same military appearance, which has been traditional in the sounding of taps for over 140 years. While the practice of using trumpets instead of bugles is necessary under some circumstances, the authors think that the traditional use of bugles as practiced by the Army Band is much preferable. There is no way to tell what Bach may have thought when Mitchell contacted him about making a bugle. After all, he had never been very successful in selling them. Perhaps his business was successful enough by the 1950s to provide some as a community service. He may have thought that he would get favorable publicity from having his bugles played regularly in Washington, D.C. ceremonies. Maybe he just did it for his friend Mitchell. Whatever the reason, Bach was not going to go all out at first and deliver an exceptionally high-quality bugle. Bach probably thought then, as earlier, that there was no need for Stradivarius Model quality in a bugle. Accordingly, the first bugle he made for the Army Band was an Apollo bugle. Apollo was his then-dormant trademark name originally used for his second-line instruments when he first began production. In February 1950, Bach’s first bugle was delivered to George Myers, the Army Band’s principal bugler, for a 30-day trial. The price of the bugle was $45. The invoice identifies it as an American Legion Model. It is probably a Bb version of an earlier American Legion Bugle described briefly in Part One. Its components (bell/mouthpipe) would be different, however, as the American Legion Bugle was pitched in G/F. 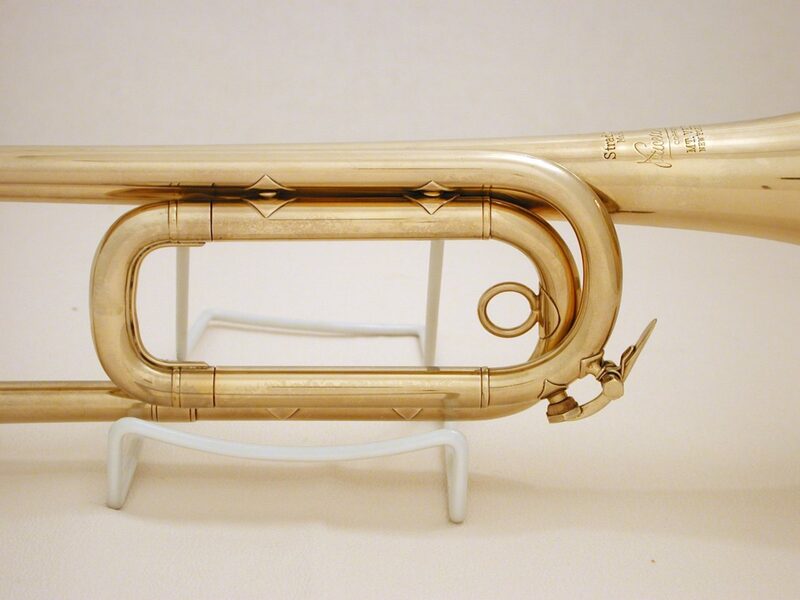 The Apollo bugle is currently on display at Brucker Hall, which is the home of the Army Band. Because the Band holds many musical events there each year, it has a spacious entrance room with a large presentation case housing various memorabilia. The Apollo bugle is one of the items on continual display. The bugle is a very nice looking instrument in part because it is gold plated. A comparison to Apollo bugle #367 (Part One) shows many of the same construction features, but it does have some welcome changes. The photograph above shows the addition of a water key. The old practice of soldering the lower portion of the tuning slide to a metal bar gave way to diamond braces. (The edges of the braces are visible in the above photograph.) The braces improve the appearance of the bugle compared to the older ones. The above photograph of the bell shows that the bugle has been refurbished. The buffing was rather heavy handed. The stamping is the same as on Apollo bugle #367 (Part One) with two notable exceptions. First, this bugle has no serial number. The second exception is the addition of the number 55 stamped on the bell. The number 55 is neither the serial number nor the model number of the bugle, although it certainly might appear to be either one. Bach simply did not use model numbers on instruments. On many vintage Bach instruments, particularly in the 1930s, numbers that give the appearance of being model numbers are routinely found stamped to the right of the word “Model”. Those are bell mandril numbers, however. In any case, the invoice for this bugle shows a #37 bell, not a #55 bell. The authors concluded that the number probably is a pseudo gauge number representing the thickness of the bell (Reference 1). The number 55 means the bell is approximately 0.022 inches thick. This is thicker than the brass found in the majority of Bach trumpets from the early 1950s. While Bach routinely used thicker brass for special bell alloys such as bronze, the authors cannot identify the alloy used in this bugle. It is worthwhile to note that the bell tail of the Army Band’s Apollo bugle is fit over the bugle’s tubing just as was the case on the older Apollo bugles. The photograph above shows this feature as well as other details that are similar to the older bugles. The authors were pleased when a photograph of this bugle was brought to their attention. The photograph shows Myers using the bugle at Arlington Cemetery (see below). The photograph above is part of one that appeared on the May 1961 cover of “American Legion Magazine”. Albert Alexandro took the photograph. Jari Villaneuva (see Acknowledgements) provided a copy of the magazine. Betty Myers (see Acknowledgements), George Meyer’s widow, graciously agreed to the use of George’s photograph for this article. 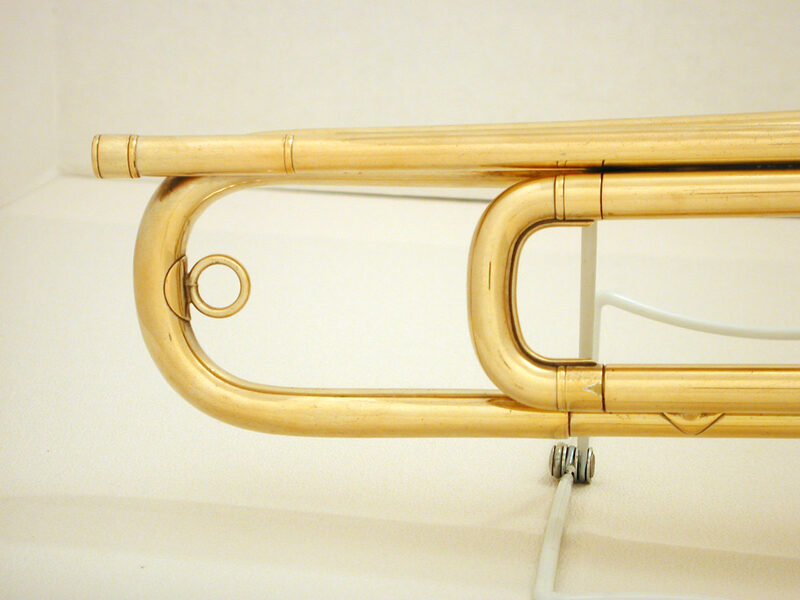 Aspects of the bugle are hidden, but enough of it can be seen to identify it as the Bach Apollo bugle on display at Brucker Hall. By the late 1950s, Mitchell had already found that the one bugle was not sufficient to meet the Army Band’s needs. There needed to be a second one, at least as a backup. He again contacted his friend Bach, and in April 1962, a second bugle was delivered to the Army Band. Unlike any of his other bugles, this one was a Stradivarius, Bach’s top-of-the-line model. The astute reader will note right away that it was actually the Selmer Company that delivered this bugle to the Army Band. In September 1961, Bach sold his company to Selmer. Bach was retained in an unusual capacity. He was given the title of President of the Bach Corporation and simultaneously retained in a “consulting and advisory capacity”. The title appears to have been honorary, however, as a Selmer employee was put in charge of manufacturing at the Mt Vernon Bach plant. Immediately after the company sale, Bach seems to have tried to continue satisfying important customers. There is some sketchy but persuasive evidence that he ran sort of a “custom instrument shop” within the Mt Vernon plant where he had instruments configured to suit the needs of trumpet players he knew. The authors believe that it was in this environment that Bach worked on the design for the Army Band’s Stradivarius Model bugle. Made to accomplish essentially the same objectives as the Apollo bugle, i.e., play similar to the Band’s trumpets, the Stradivarius bugle is significantly more refined than any of the Apollo bugles, both in acoustical design and appearance. Such a bugle would increase manufacturing costs, but readers might also note that this was no longer Bach’s concern. All he needed to do was to convince the Selmer Company of the importance of the customer. A picture of the Stradivarius bugle is shown below. This bugle is arguably the most elegant bugle ever made. The authors tried to capture accurately the bugle’s color, but they were not entirely successful in this. The gold tone is lighter than that of the Apollo bugle. Viewed at certain angles, it almost gives the impression of being silver plated. The authors cannot pose a sensible reason for the difference in color between the two bugles other than to say that the Apollo has been re-plated. They have discussed plating color with a prominent plating company. The tone of gold plating apparently is not too hard to control. The appearance of the Stradivarius bugle is striking partially because of its unique color. The mouthpiece receiver is easily identified as a Stradivarius receiver. With its hexagonal design, it is stronger than the Apollo receivers are. The receiver has the bugle’s serial number, 1962-1, stamped on it. A new serial number series was started for this bugle. The number 1962-1 means that it was the first Stradivarius bugle made in 1962. Obviously, someone at Selmer thought that more were to follow. Letters written later between Bach and the company make it clear that this was the only one made. Certain other design features of the Stradivarius bugle also contribute to its elegance compared to the Apollo bugles. First, the upper and lower braces between the tuning slide and other portions of the bugle’s tubing are positioned so that the bugle has a balanced appearance, top to bottom. This is possible because of the tuning slide used on this bugle. The tuning slide is narrow. It was adapted from Stradivarius trumpets made in an earlier Mt Vernon design period.Â This allowed for more room for the upper diamond braces. The Stradivarius bugle is not soldered the entire length between the mouthpipe and bell as the Apollo bugles are. Rather, it has only two contact points. One is a small brace between the front of the mouthpipe at the first curve point and the bell. The other is a short solder joint between the bell and mouthpiece receiver. These features are shown in the photograph below. This photograph has been lightened somewhat to show the two contact points between the mouthpipe and bell. This is a better acoustical feature than a solder joint running the entire length of the bell. The tuning slide can be viewed in a little better detail in the following photograph along with some interesting other features of the bugle. This photograph makes it evident that the tail of the bell has a sleeve coupling it to the rest of the bugle’s tubing, thus avoiding the need to stretch the bell tail and eliminating the unsightly “hump” of the Apollo bugles. The shop card for the Stradivarius bugle is shown below. The shop card was found among a large number of shop cards maintained on Selmer instruments (not Bach instruments). Discovered some time ago, there did not appear to be any explanation for such an odd shop card until one of the authors got a chance to examine the bugle itself and remembered seeing the card. The back of the shop card shows that it was sold through Kitt Music of Washington, D.C. Kitt Music was a Bach dealer at the time the bugle was made. 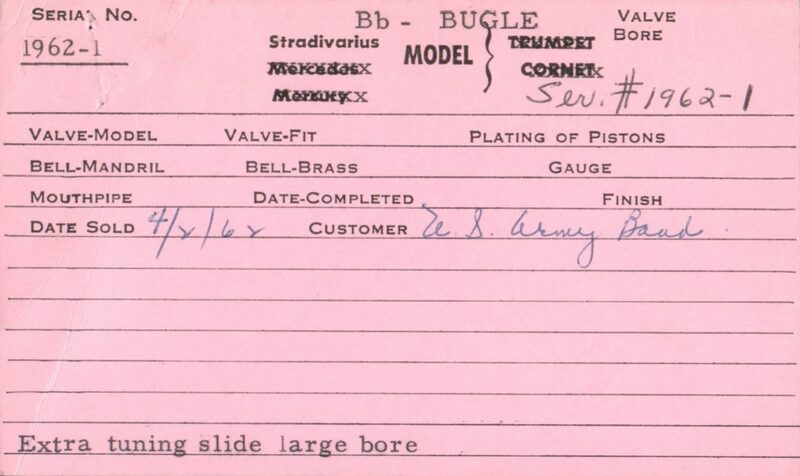 The shop card tells little about the bugle except for the date it was sold, that it was sold to the Army Band and that it had an extra tuning slide in large bore size. The latter fact implies that the bugle was probably outfitted with a medium-large bore tuning slide originally, and that is probably the bore size of the bugle.Â The large bore tuning slide is on the bugle today, but the whereabouts of its primary tuning slide is unknown. Bach’s correspondence indicates that this bugle has a #37 bell just as the Apollo bugle does. The stamping on the bell is what one would expect. It reads Stradivarius Model, Mt Vernon, New York. As noted previously, the authors think that this bugle is the only one of its type built at Mt Vernon. There is among Bach’s records, however, a sketch of a Stradivarius bugle he designed in 1955/6. That design had different features and dimensions. As of now, the authors have not been able to verify that any of those bugles were actually made. 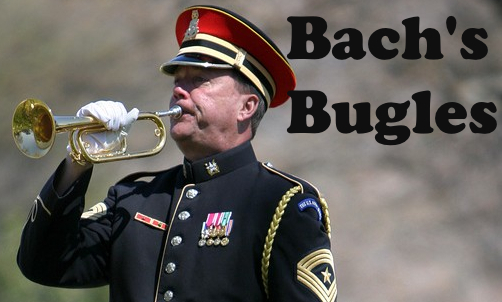 George Myers was the first bugler in the Army Band to use both Bach bugles featured in Part Two of this article. He received the Apollo bugle on behalf of the Army Band in February 1950. He used it until the Stradivarius bugle was delivered in April 1962. The Stradivarius bugle was available to him for only a short time, however, as he retired within two months of the bugle’s arrival. 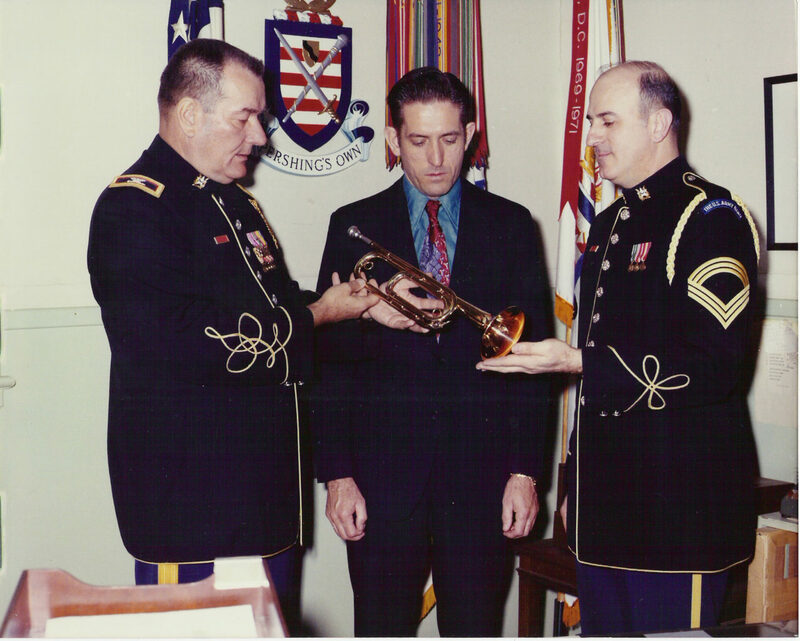 Keith Clark succeeded Myers as the principal bugler in the Army Band. He held that position for only about four years, but a catastrophic event during his tenure raised both him and the Stradivarius bugle to prominent positions in history. John F. Kennedy was the president of the United States when the Stradivarius bugle was delivered to the Army Band. Mr. Kennedy was assassinated on November 22, 1963.Â He was buried at Arlington Cemetery on November 25, 1963. On that day, Clarke played taps as part of the nation’s final tribute, and he played in on the new Stradivarius bugle. The bugle has become almost universally known as the “Kennedy bugle”. It is now is on display at Arlington Cemetery where it and other memorabilia commemorating that tragic event reside. The Kennedy bugle was not placed at Arlington Cemetery immediately after the funeral, however. It traveled a rather interesting path to its current resting-place. The Army Band retained and used the Kennedy bugle for the next 10 years. In 1968, Pat Mastroleo was awarded the position of principal bugler. Mastroleo held the position until his retirement in 1991. Three ex-presidents died during the years while Mastroleo was the principal bugler: Dwight D. Eisenhower (1969), Harry S. Truman (1972) and Lyndon B. Johnson (1973).Â Mastroleo used the Kennedy bugle to play taps at the funerals of all three. Eventually, the Army Band was directed to turn the bugle over to the Smithsonian Institution because of its association with John Kennedy’s funeral. It was transferred on April 3, 1973. The following is a picture of the transfer of the bugle. an unidentified curator from the Smithsonian Institution and Mastroleo. After the Kennedy bugle was transferred, the one Bach bugle left for Mastroleo to use was the Army Band’s Apollo bugle. An interesting letter indicates the strong possibility that Mitchell originated the idea of retiring the Kennedy bugle and presenting it to the Smithsonian Institution while at the same time arguing to get some additional high-quality bugles for the Army Band. In 1969, Bach wrote to Jack Feddersen, President of the Selmer Company, about a number of items. In that letter, he suggested that Feddersen “ask Gil Mitchell whether he would donate the original (bugle) to the Smithsonian Institution if you make an exact duplicate and donated it to the band.” Bach also had a suggestion for making an engraved silver tag for the Kennedy bugle with a special inscription identifying Bach as its maker, among other things. As mentioned earlier, the Selmer Company actually made the bugle, although Bach certainly played a major role in designing it and overseeing its production. Moreover, Feddersen was not in a position of recommending the Kennedy bugle for the Smithsonian. The authors suspect that this was not Bach’s idea. Regardless of who originated the idea, the bugle was transferred to the Smithsonian. The Selmer Company did its part by offering to make a duplicate bugle. Bach tried to facilitate that part of the process in his letter to Feddersen by giving instructions where in his special files to look for the appropriate sketch of the Stradivarius bugle. Unfortunately, no one at the Selmer Company could locate the sketch. (The folder that Bach said the sketch was in was recently found again, but the sketch of the Kennedy bugle was not in it.) Since Selmer could not locate the sketch, Mastroleo was sent to Elkhart Indiana early in 1973 to help with developing a replacement bugle. He took the Kennedy bugle with him, ostensibly to make measurements of it. 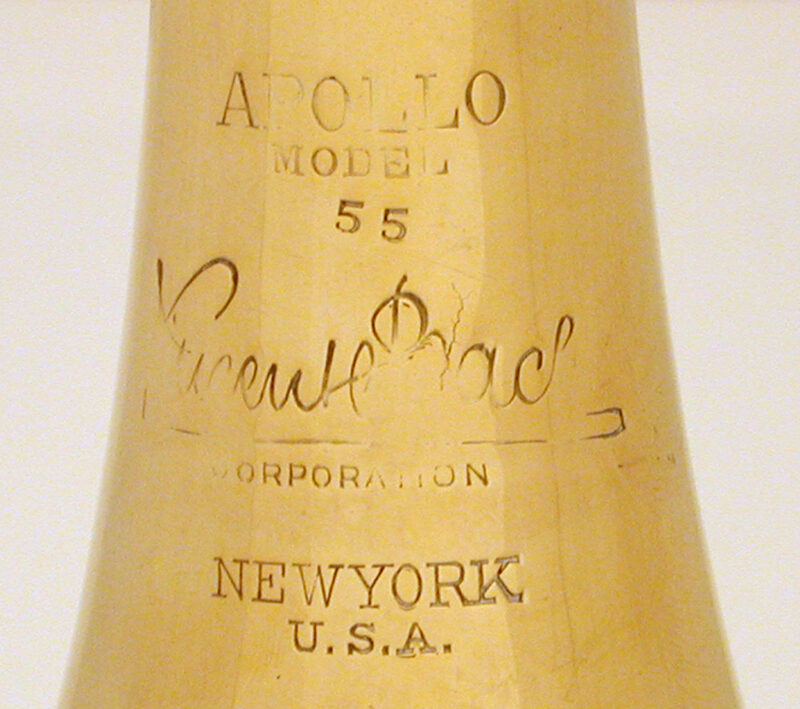 Mastroleo’s efforts were unsuccessful, and the Selmer Company instead made some Stradivarius bugles with some of the Apollo bugle’s features. The bells were soldered the length of the mouthpipe. They were gold plated, partially to cover the long solder joint, and they retained the number 55 on the bell. The number was moved up to follow the word Model under the mistaken notion that this number was Bach’s model number, an error as discussed above. These bugles are large bore instruments. Since large bore Bach trumpets were routinely made with #25 bells, the Elkhart Stradivarius bugles use this bell also. The tuning slides are not the same width as found on either the Apollo or Kennedy bugles.Â They are made to later design specifications. The Selmer Company made six bugles for the Army Band. Another six were made in the 1980s. The total production records are not available to indicate how many additional bugles may have been made for general sale. Occasionally, one of these bugles is seen for sale on the open market. This article could not have been written without considerable help from a number of people. Foremost among them is LTC Gilbert H. Mitchell, Music Director AUS Retired. During his illustrious career in music, Gil Mitchell was both a cornet soloist and later the Assistant Leader of The United States Army Band. During most of his time in the Band, he had an on-going association with Vincent Bach. To illustrate how close an association they had, Bach gave Gil is entire music library, which Gil then donated to the International Trumpet Guild. From the standpoint of the authors, however, the most important part of their association with Gil involved discussions of Bach’s bugles. Gil arranged for the Army Band to buy the bugles featured in this article. The most important one was the Stradivarius bugle used for President Kennedy’s funeral. Gil not only provided that authors with background on this bugle but others as well, freely providing the authors with access to his personal collection of memorabilia and letters. Gil’s assistance was invaluable in writing this article. The authors also owe special thanks to another Army Band alumnus, Patrick Mastroleo, SGM USA Retired.Â Pat, as noted in the article, was the principal bugler for the Army Band for 23 years. During that time he played taps at the funerals of several notable people, including several ex-presidents. More to the point for the authors, Pat actually used the Bach bugles written about in this article. His recollections were instrumental in helping piecing together the background on these bugles. Not least among his contributions, he also provided valuable insights into what it means to be a bugler in The United States Army Band. The authors got significant help in preparing this article from MSGT Jari Villaneuva, United States Air Force Band. Jari is quite likely the foremost authority in the country on ceremonial bugles and their use. He owns an extensive collection of bugles and bugle-related memorabilia. He provided many hours of consultation to the authors, often by providing examples from his collection. If the authors made historical mistakes in this article, it was not from a lack of effort on Jari’s part. Significant help in preparing this article was provided by The United States Army Band. In particular, MSG Michael Yoder who serves as the Army Band’s historian helped by providing contacts with most of the Army Band alumni interviewed for this article. Most importantly, he arranged for the authors to take pictures of the Army Band’s Bach bugles. Betty Myers and her son Phil Myers provided numerous documents to the authors that helped determine important aspects of the chronology of the Army Band’s Bach bugles. The authors appreciate having the information as well as permission to use George Myers’ photograph. Along with the documents, the authors were privileged to hear stories about George. One in particular is most interesting. After the Kennedy bugle arrived, George took it home. Admonishing young Phil to stay away from it did no good, and Phil dropped it on its bell bow. It got a small dent in it, which Phil saw again within the last few years when the bugle was put on display at Arlington Cemetery. In addition to the above, this paper was written through significant support from Conn-Selmer, Inc. of Elkhart, Indiana. Access to their data was essential to understanding Bach’s bugles. The most notable information came from a special folder Bach kept on his bugle designs. The folder had been missing since the Selmer Company moved Bach manufacturing to Elkhart Indiana in 1964. Through some miracle, the folder survived over the last 40-plus years.Â During a search for it with one of the authors, Mr. Tedd Waggoner, Conn-Selmer’s Marketing Manager of Brass Winds, found it in an obscure file cabinet. The authors were allowed complete access to the material contained in it. i am touched – as an American , a former soldier . . .
as well , my identity as a brass player understands . .
Jari, for some reason I made a reference regarding the bugle to one of my students during his lesson. He’s in 5th grade and Korean, so there are some things he has not been exposed too in the area of music. One quick look at the Wikipedia article led to other articles, including yours. One thing that I greatly enjoyed was your two articles about Bach’s dance around the issue of actually making and marketing his fine bugles. For years I have wanted one, but I see from your fine research that it seems the best one to have would need to be purloined from the Smithsonian! Thanks for the excellent work you did in writing these two articles!